Hero of the Heartland is an interpretive biography that focuses on the ways in which the man and his career resonated with the hopes and fears of his contemporaries as they coped with the economic, social, and cultural changes around the start of the 20th century. Robert F. Martin shows how Sunday and his revivalism helped his followers bridge the gap between the traditional past and the progressive future, and made more comfortable the transition from the old order to the new. 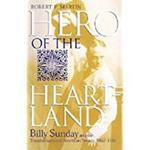 Martin, Robert, "Hero of the Heartland: Billy Sunday and the Transformation of American" (2002). Faculty Book Gallery. 453.